World-renowned for its vast plains of wildlife and its overwhelming natural beauty, Tanzania is a very rich one stop Africa safari destination that is flocked by thousands of travelers every year. 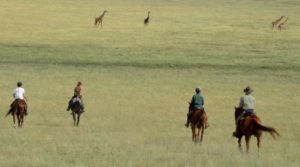 Are you interested in un folding on your adventurous Tanzania safari, get a horse-riding safari Tanzania included in your itinerary so you get to enjoy a Tanzania wildlife safari outside your 4×4 safari vehicle? Horse-riding safaris creates unbeatable memories that will last a lifetime by giving you the ultimate outdoor feeling of being in the wild, other than just being confined inside your safari vehicle. During your horseback riding safari in Tanzania, you will experience a true African safari, riding through groups of giraffes, herds of zebra, antelope, gazelle, and wildebeest, and from a safe distance watch the “Big Five”- lions, elephants, leopards, buffalo, and rhinoceroses. Each horseback riding safari Tanzania is led by qualified and professionally trained guides in Tanzania that will make sure you enjoy your exhilarating adventure. You will be taken to the routes are off the beaten track where you will enjoy the countries fauna and flora. As you go deep in the bushes, as part of your adventure, you will enjoy the wonders that Africa has to offer including the magnificent wildlife, the scenery and the magical interaction with the local tribes who inhabit these areas. All this will be viewed from what back in the days also used to roam wild like other animals, the horse. 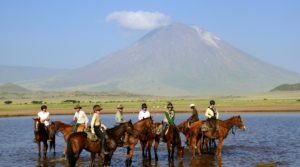 Where in Tanzania can you enjoy a Horseback safari? Serengeti National Park is situated in northern Tanzania and is famous for its massive annual migration of wildebeest and zebra. What better way can you experience the Great Wildebeest migration than from horseback? Horse riding over the vast plains of the Serengeti, next to massive herds of wildebeest, zebra and other wildlife, is a truly exhilarating experience you should not risk missing. Have you had chance to gallop along a pristine white sand beach, next to the gentle and warm waters of the Indian Ocean? Then let’s go enjoy this magical memorable Tanzania safari experience because this horseback ride in Zanzibar is a must do! Mount Kilimanjaro in Tanzania is surrounded by stunning savannahs and wilderness areas, and horse riding in the shadow of this famous mountain is a typical safari experience. With no fences, buildings or roads in sight, the opportunities for spotting wildlife are endless. In addition to the brilliant game viewing, the area has some of the most spectacular scenery in Africa. As you ride, there are also numerous opportunities for interactions with the local people and herdsmen, ensuring a wonderfully enchanting cultural experience. Once you take this Kilimanjaro Big game trail, you will have the opportunity to live your “Out of Africa” dream trip. Are you thinking of a horseback safari in Tanzania? Get in touch with us and we’ll help you plan your perfect trip. Another easily arranged extension to your riding safari in Tanzania is gorilla trekking in Uganda or Rwanda.